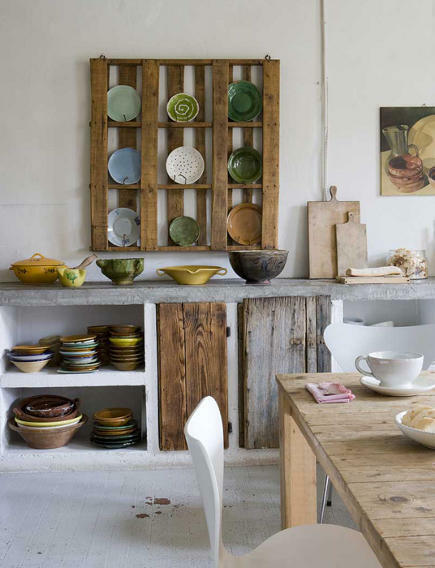 A modern kitchen plate rack has a practical use + heaps of decorative character. When I removed the upper cabinets from my kitchen plan I had very good reasons: it was annoying to open and close a door every time I needed a plate. I also was tired of lifting heavy stacks of dishes from the counter to upper cabinet shelves, and I didn’t care for a high-use cabinet that would require a climb to clean. So I customized a kitchen plate rack that holds 3 dozen plates and half a dozen mugs even though the woman at the kitchen cabinet shop tried to talk me out of my idea. Every day when I unload the dishwasher, I’m glad I didn’t listen. My kitchen has three plate racks and I will never have upper cabinets again! 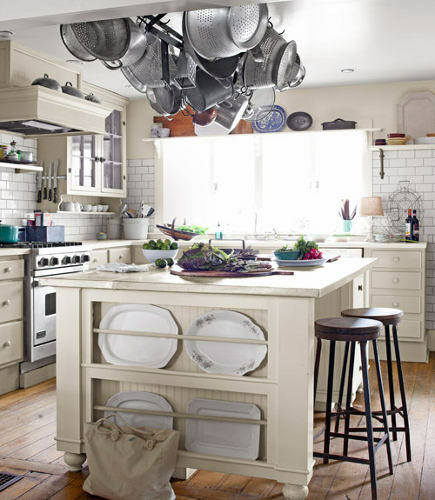 Even a minimalist kitchen can support a plate rack although this mode of open storage is usually associated with vintage, country or traditional styles. 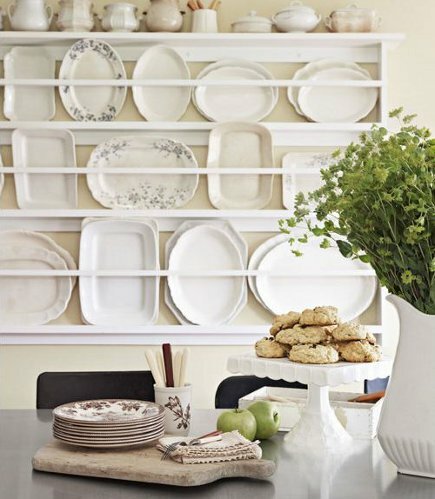 A wall-hung, white-painted plate rack [top] provides a tone-on-tone backdrop for platters collected by a New Jersey jewelry designer. The rack has a top shelf – handy for additional storage – but no back. Platters tilt forward against horizontal rails and are held in plate by a vertical lip on the back of each shelf. One bonus is the ability to double-up on the storage, as the owner does. 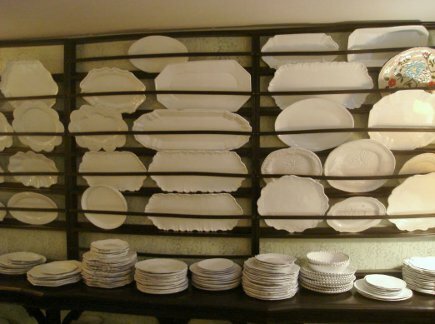 A shadowbox white-painted kitchen plate rack, with a plank back, was expanded to occupy an entire wall on a kitchen aisle. It’s a clever use for an otherwise unusable large space adjacent to the refrigerator. 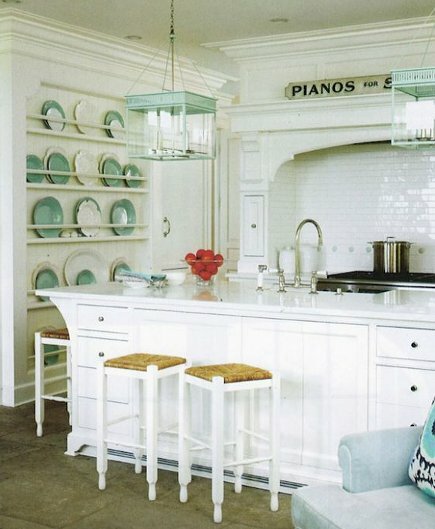 By coordinating plate color with the green-painted lantern lights over the island, the open storage does double duty as an accessory wall and focal point for a lovely kitchen that otherwise might lack personality. The ends of islands are often closed by flat panels but in this Ohio farmhouse kitchen that dead space is put to good use for platter storage. We saw a similar idea in the Antique Island Kitchen. An especially clever island design (the counter top is wrapped in zinc) also includes bar seats and conceals storage on the working side (the telltale cabinet base peeks out behind the handbag on the floor). 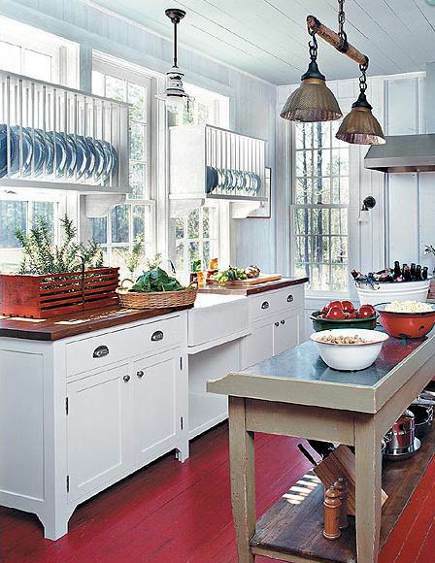 In a large kitchen with windows on the entire sink wall, a pair of custom plate racks without backs flank the farm sink. Ditching the backs allows natural light into the kitchen at all times, illuminates the dishware, and solves an obvious storage issue. 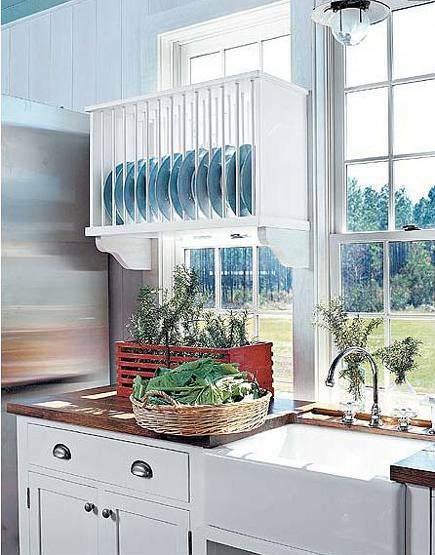 While the owner stores colorful dinner plates (this rack is to the left of the sink), the racks are tall enough to hold chargers or platters. A vintage French provincial green plate rack (the color was popular during the late 1940s) is small enough (26” h. x 25” w. ) to hang anywhere. Open at the bottom, it was designed for plates to drip dry over a small sink. 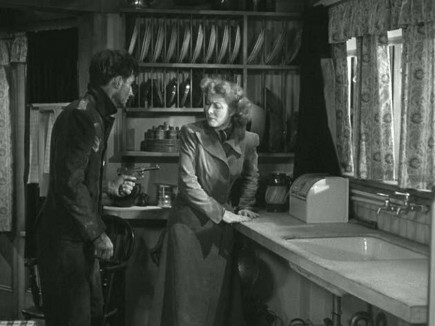 One of my favorite plate racks appeared in Mrs. Miniver, the 1942 Oscar winning WWII movie starring Greer Garson as a courageous English middle-class housewife who finds a desperate, injured German flyer (the guy with the gun) in her kitchen while her husband (played by Walter Pidgeon) is out on his boat helping with the evacuation of British and Allied forces from Dunkirk in June 1940. Much of the action takes place in her typical mid-century kitchen — which has a wonderfully old-fashioned above-the-counter built-in rack with slots for dishes, pans and lids plus a shelf just within reach of the sink. Smallbone of Devizes, the bespoke British cabinet company, makes a plate rack in their Pilaster line, inspired by 18th century cabinet style. This signature piece, topped by a handsome cornice, holds a ton! 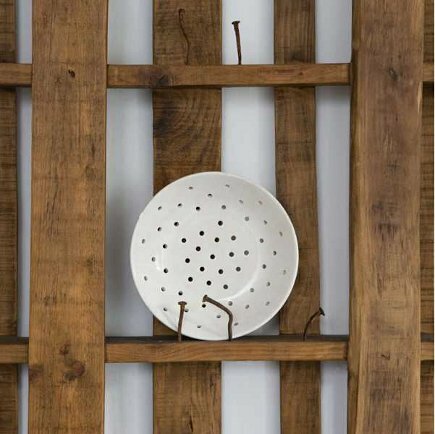 A large wooden plate rack in the hip Parisian accessories store called Astier de Villatte, shows how effectively dark wood contrasts with white dishware. Racks like this one, set over a shelf or console table, are often found in Swedish manor house dining rooms. 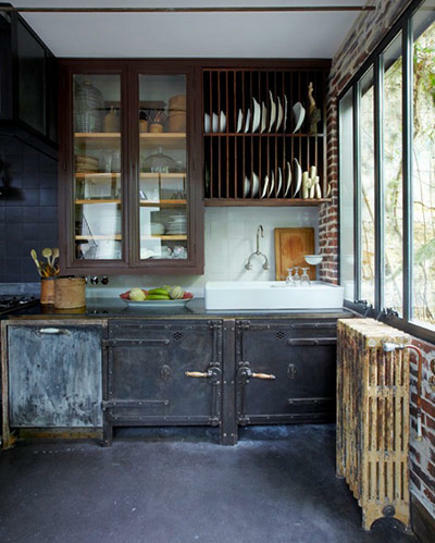 Another dark French rack – in an industrial Paris loft converted from a carousel workshop – offers a double tier place to stash larger objects high over the sink. Vintage fans might expect an open on the bottom but a dishwasher is likely concealed behind one of the salvaged base cabinets. Too high for daily use, this one is accessible via a library ladder kept in the living room. The steampunk-style base cabinets are fabulous with the concrete floor and exposed brick walls in this thoroughly boho apartment. 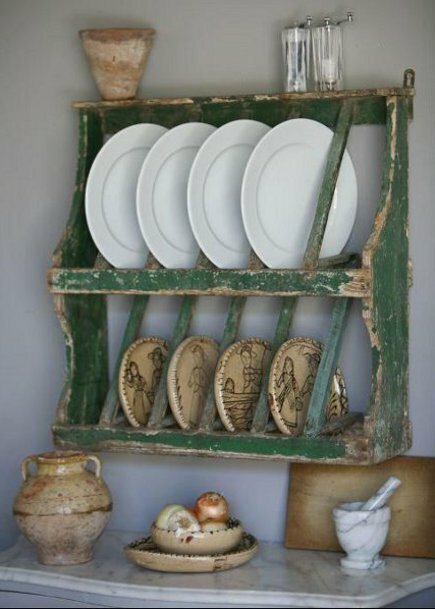 A rustic plate rack, created from salvaged shipping pallets, is part of a rustic line of re-purposed bespoke home furnishings created by Katrin Arens. The rack, called a piattaia by the Italian-based artist, (piatto means plate) is substantial at 100 x 100 cm. (39” x 39”). Bent nails driven into the shelves help keep dishes in place. I made racks for my kitchen in London, my first essay into finished joinery. I loved them, and they were so easy. Maybe I should do it again, these are lovely. This is a nice collection of plate racks. I had a very small (portable) rack I bought to use on the microwave shelf in our last home. When working on this house, I knew the kitchen was going to have one and fell in love with a double plate rack I saw in a magazine. Changed it up a bit to work in our pine hutch. 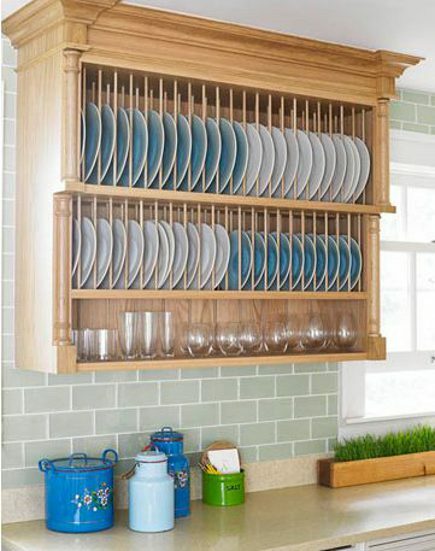 I won’t ever have a kitchen without a plate rack now. Thank you. One would look right at home in your kitchen. I’ve never lived in a house with a plate rack, and I’m not sure I’ve ever been in one either, so I never considered one for my kitchen. Now I might regret it! Are they just not that common on the west coast as they are in the east? These are nice. I LOVE the practicality and look of Mrs Miniver’s, and the high-quantity function and neat-as-a-pin look of the one by Smallbone of Devizes. And this made me notice your wonderful ones, too, Jane, in the article below about the added seating in your kitchen. The platerack next to my sink was similar to the Smallbone style but to make it fit, I had them lop off the top. It’s lacking that bottom shelf, which is really a nice feature, but I put cuphooks under mine along with a very low profile strip light. Some people on the west coast don’t feel open storage works in an area prone to earthquakes. Cannot account for the lack otherwise except to say that people get overly fixated on cabinets IMO during a kitchen remodel. I see so many kitchens without graceful open spaces or decorative elements that also function well.But I’ve lived in an apartment with a shower in the middle of the kitchen that operated by pulling the curtain around the drain. I think that people get overly fixated on fixing what was wrong in an older or past kitchen, which is often lack of storage, that we overfix in the new and leave out the fun. I wanted practicality over something like display and it was a mistake. I often recommend it to people now and cringe when I see cabinets right up to door and window trim, crowding the room and lacking that nice breathing space and grace, as you said. Cabinets are expensive, so I can understand that. But I don’t care for those kitchens which are just wall-to-wall and I’ve seen quite a few. Then there are those with cabinets just stuck up in places they don’t belong — especially uppers and particularly near ranges. They’re just hanging there looking orphaned and the tops are all at a different eye level. I do fault the so called “kitchen designers” for this and the cabinet folks for making up styles vs really doing research (which isn’t difficult) and getting the looks right. Working in some type of open element is just good design seems to me. Yes, shower in the kitchen. It was a very old apartment in Paris in the Sorbonne area. No fridge — I’d keep small amounts of butter for the morning in a little cupboard. No real bathroom either — the kitchen and bath were sort of combined with the drain in the center and the curtain that pulled around. Living in that type of space taught me how to adapt to older environments. In many parts of Europe there just isn’t the same kind of space and luxuries many here have. I don’t feel it hurts to have that type of experience; in fact I know in my life it helped me realize that not everyone lives the way I was brought up. That morays can be very different. The first time I was criticized for asking for milk for my after-dinner coffee I was stunned. Who knew? But in France, it’s not done. I took it as a broad lesson to never assume or be surprised at what you don’t know or haven’t seen — there always will be something. Hi, could you tell me how deep your customized plate rack is? My plate rack over all is 36″ wide by 29″ high. Of the 29 inches there is a top rack that’s 16″ high and 12-1/2″ deep and holds 18 dinner plates. The bottom tier of the plate rack is 9″ high x 9″ deep and holds 18 butter-size plates. Then there is a 4″ high base piece that finishes it. Here is a photo. Looking for a 60 inch two tier plate rack similar to the first white one seen in white. I live in Brooklyn, NY. Any ideas where to have this made or where to find one. Thanks. I would suggest contacting a dealer like country-gallery.com in Vermont if you’re looking for a European style plate rack.